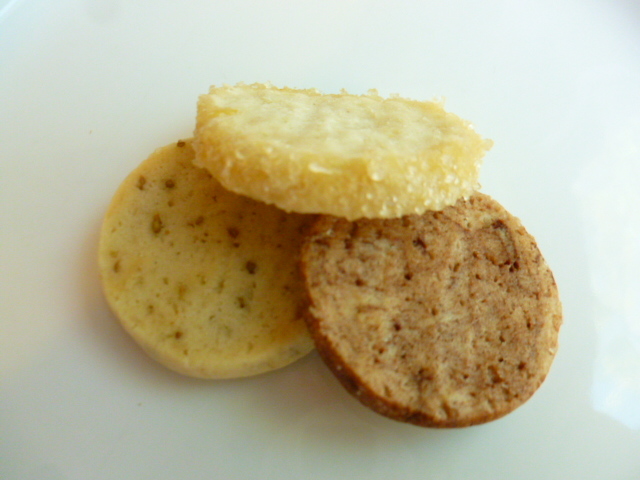 This simple and easy cookies recipe goes a long way and is extremely versatile. 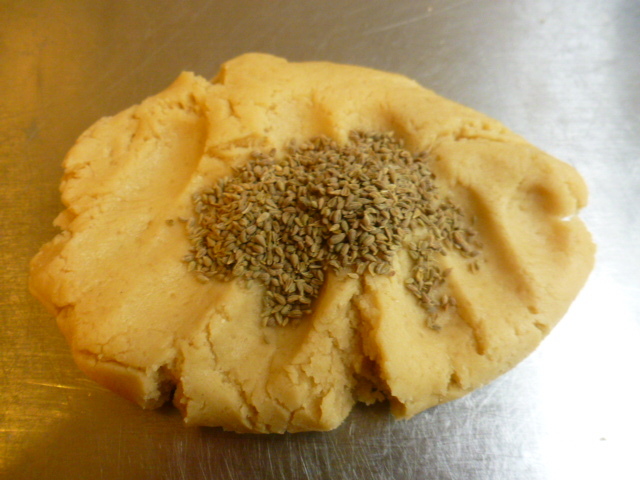 I start with basic dough, divide it into three portions and add different flavors to each. 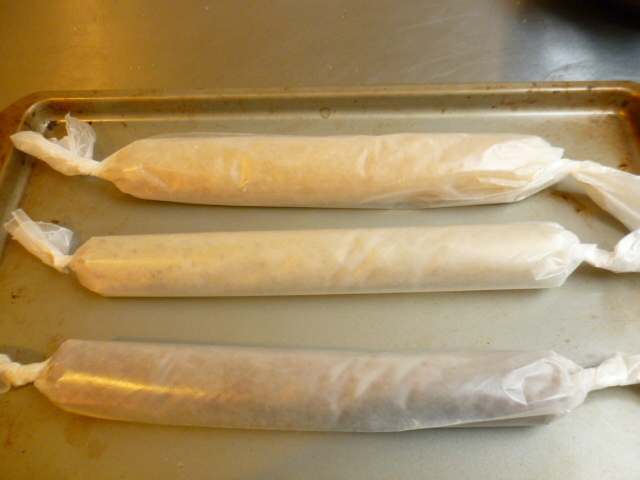 Once the dough logs are prepared, I wrap and place them in the freezer. 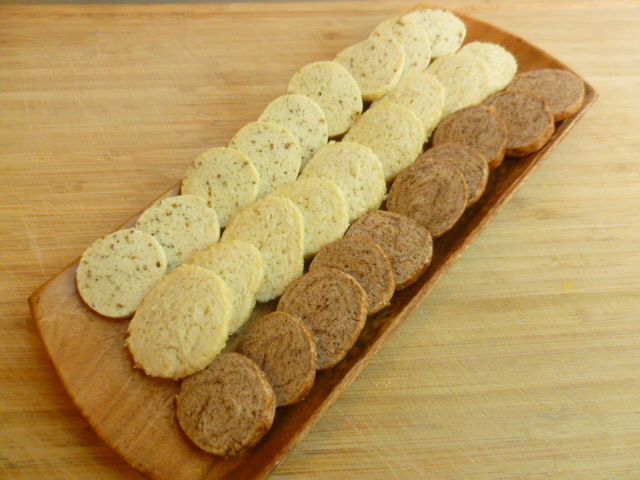 Now all that is required is to slice and bake as many cookies as needed, and in less than half an hour freshly baked cookies in different flavors are filling the air with their wonderful aroma. I’m sure that once you’ll prepare these cookies, you too will have a few cookie dough logs in your freezer at any given time. 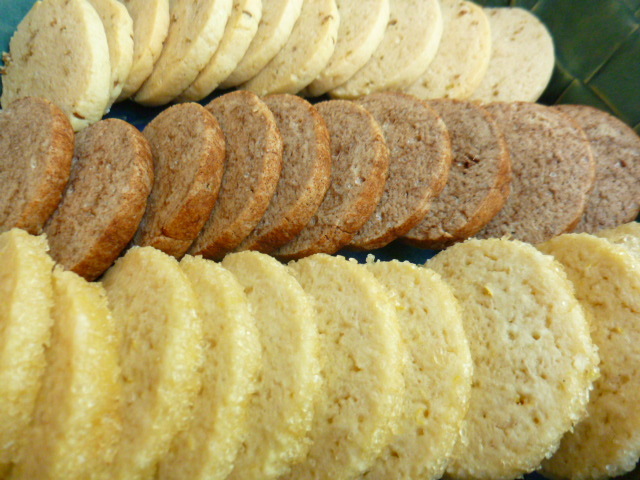 You can choose not to flavor the dough at all, to use one or more of the flavors suggested in the recipe, or add any other flavors you have in mind. 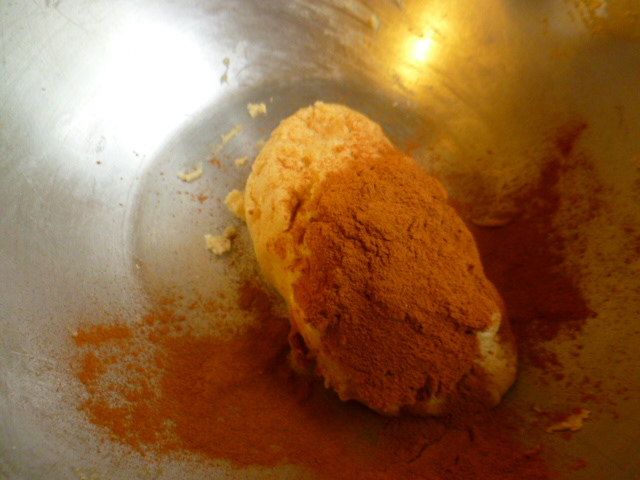 Other flavors that I sometimes use are: ginger powder, apple pie spice mix, chopped nuts, cocoa, orange…- you get the idea! 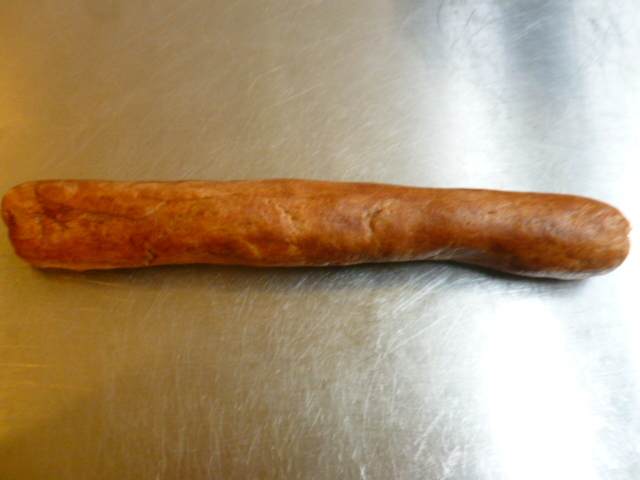 * The prepared dough logs can be kept in the freezer (well wrapped) for up to two months. 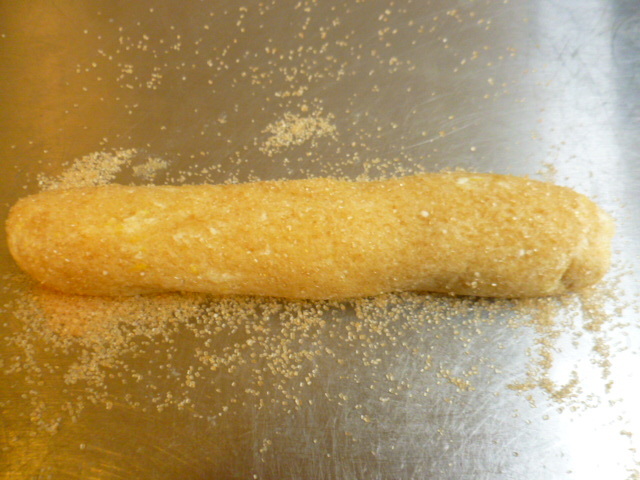 * Demerara sugar is a pale golden sugar, with fairly large grains. It adds both flavor and texture. Do try to find it and not substitute with any other sugar, especially when rolling the cookie dough log in it. 1. 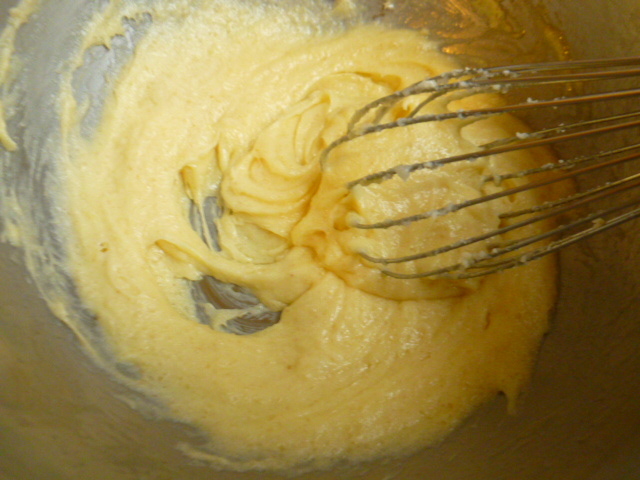 In a large bowl, whisk together the butter, white and Demerara sugar and salt. 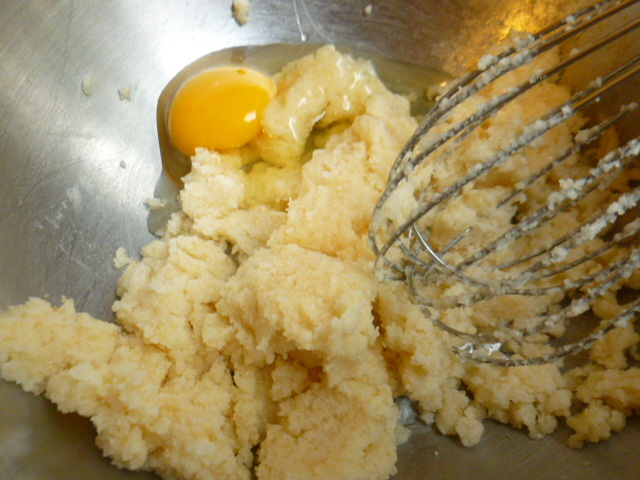 Add the egg and whisk to incorporate. 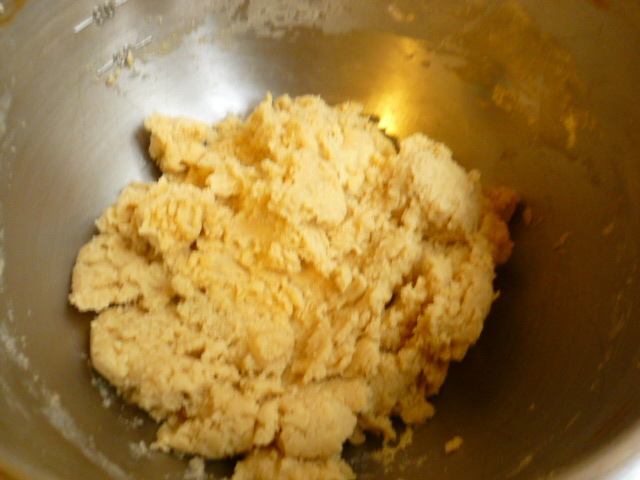 Add the flour and vanilla, and knead to form a ball of dough. If the dough is too dry, add 1-2 Tbs milk, at room temperature, to help bind it. Make sure not to add too much milk. 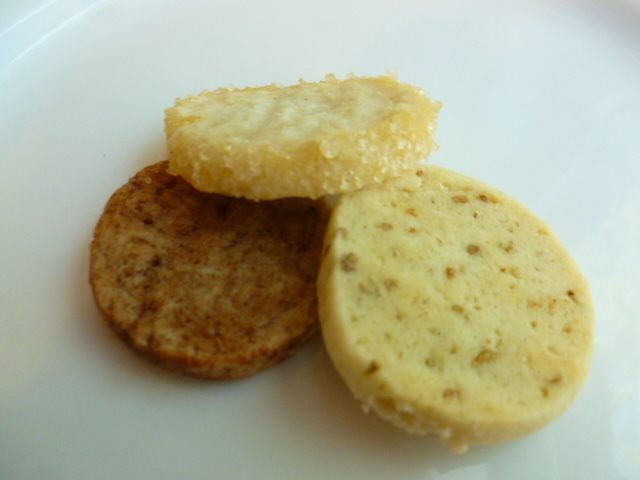 Cut the dough into 3 portions. 2. Add to each portion one of the flavorings above. 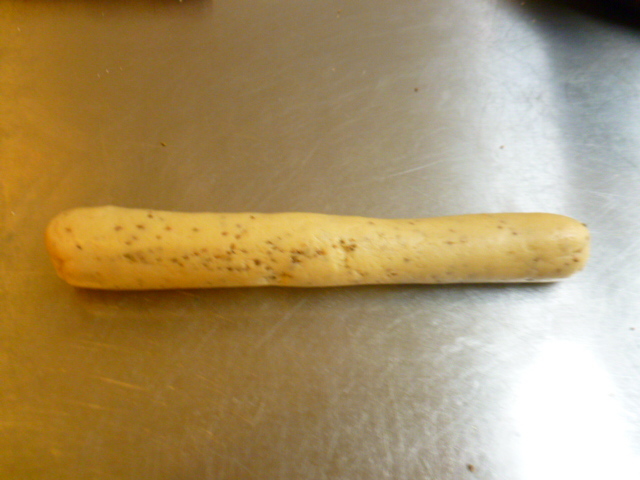 Knead to incorporate and roll each into a log about 1.6” (4 cm) thick, and about 11” (28cm) long. 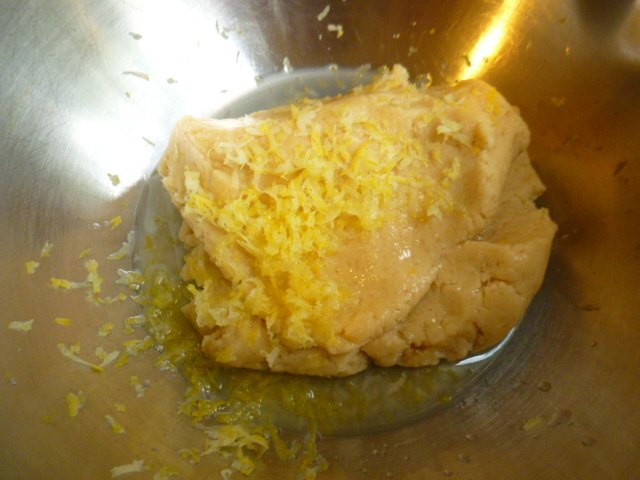 Roll the lemon dough in Demerara sugar. 3. Wrap each log in wax paper and place on a tray. Place in the freezer for at least 4 hours. 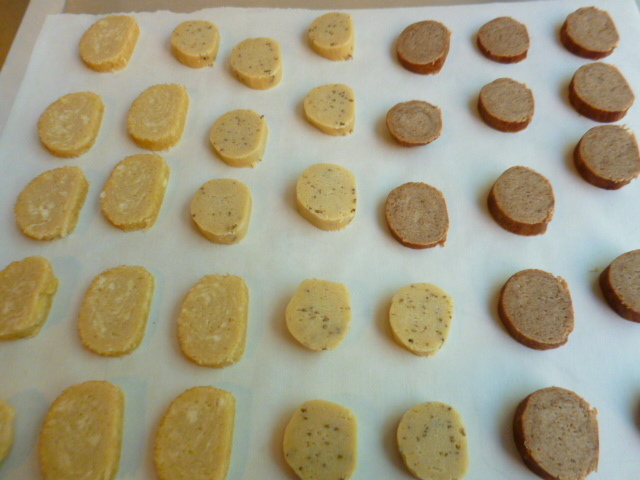 To freeze the cookies for a longer period of time, place the logs in a freezer bag, and squeeze out the air. 4. To bake: preheat the oven to 355F (180C). Line a baking tray with baking paper. 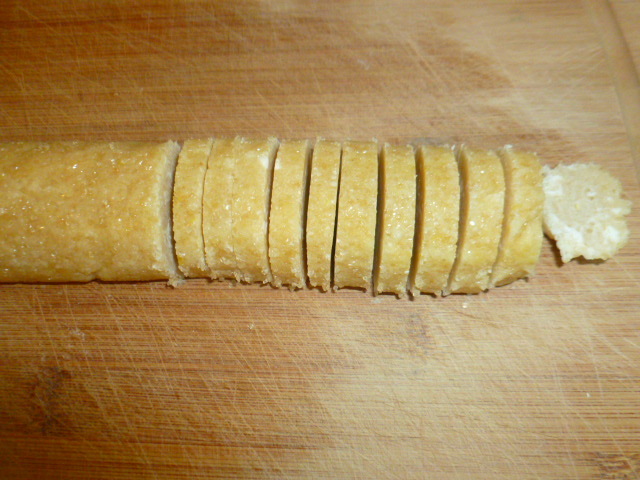 Place the dough logs on a cutting board and cut, with a sharp, heavy knife, into thin slices, about 0.2”(0.5 cm). 5. 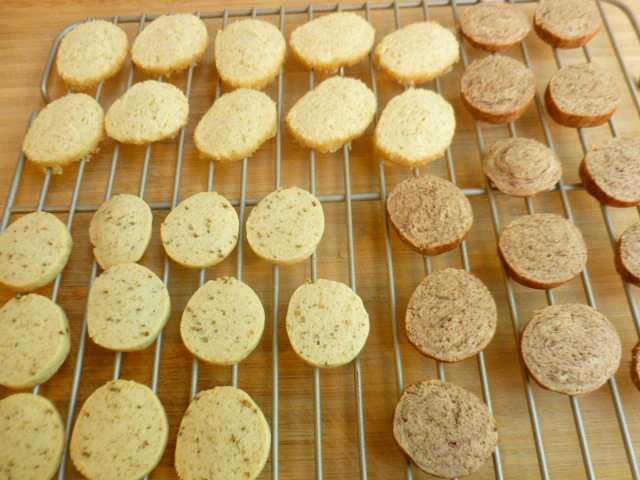 Bake, from frozen, for about 15-17 minutes, until the cookies are lightly golden at the bottom and sides. Let cool in the pan for 2-3 minutes, before transferring to a rack to cool completely. What a great idea for sure! I love the three flavors! These look wonderful! Thanks for posting I will make them. These look super delicious. Nice for an afternoon cup of tea! very clear recipe…I love the idea of 3 flavors! Thank you Linda, I’m glad to hear. love it and bookmarking it. That is a great idea, Ronit! I like how it’s easy to get at least three distinct types of cookies out of one batch of cookie dough. Until I read this post, I’d never heard of Demerara sugar. I’ll have to look for it. 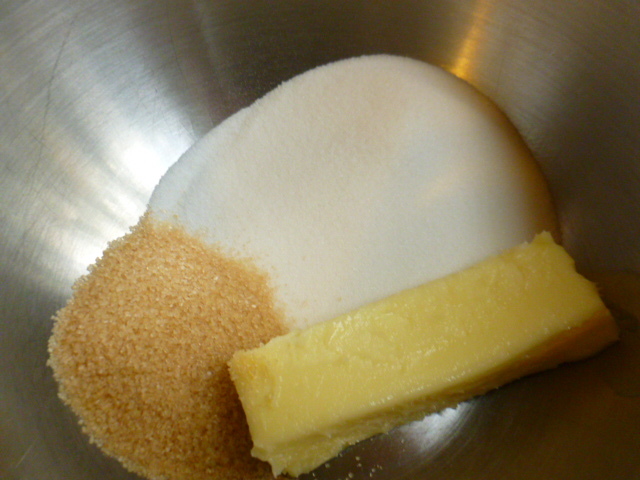 Demerara sugar is a nice addition in the kitchen. I think it’s worth looking for. Thanks for the great recipe. Great time saver during the holidays. 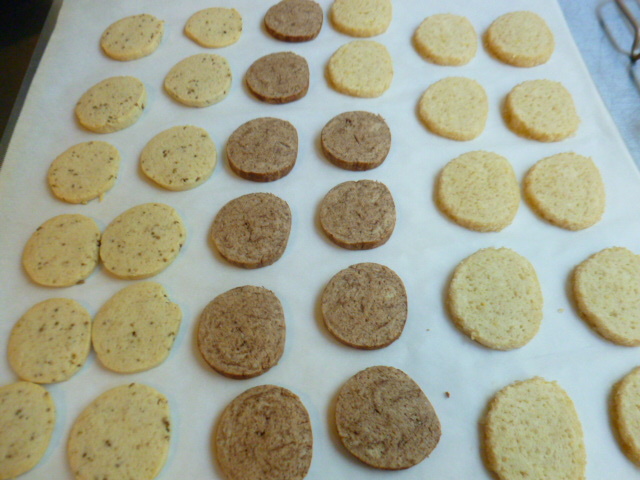 I admit, I am not a fan of anise – could you substitute almond extract for anise for the third batch or would it affect the texture negatively? As I wrote in the introduction, you can change the flavors as you wish. Almond extract sounds great, but if it is a fairly large amount of liquid, then add 1-2 Tbs cornstarch, as I did with the lemon version. Ronit, I have been looking for make ahead cookies! Do you think I can ship these easily for holiday cookies? yes, these cookies are quite suitable for shipping. Thanks so much!! I know it’s a while away, but the time almost always creeps up on me. This is going to be great!! Such a lovely idea to have biscuits on call. These look great – I will definitely try! 1 dough, 3 flavours?! Love it! I live above 7,500 ft. in Colorado. Can I leave the recipe the way it is or do you think I should lower the sugar in it??? Very interesting question! I’m afraid I really don’t know the answer to that, as I’ve never baked in such altitudes. However, compared to most recipes, I usually use relatively smaller amounts of sugar, so I suggest to maybe try the recipe as is first (maybe half the amounts for the trial) and then decide. I’ve got the butter out all ready for baking these in the morning. I’ll let you know how they came out darling!! Oh, I feel so bad. I wasn’t able to get to them this morning. Family Business came up but I promise, I will get to them tomorrow morning, come Hell or High Water!!! !